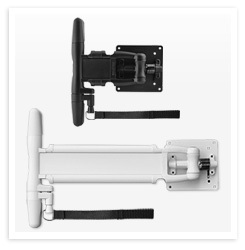 Southco’s Tilt, Swivel and Swing Display Mount (A Series) is now available with an added feature that allows the arm to be locked into position for easy storage. Designed with a plunger that securely locks the arm into place, the A Series maintains position in extreme conditions where motion or vibration may cause display drift. The locking A Series provides reliability and proven tilt positioning while holding displays securely in place during touchscreen operation, under vibration, or when devices are mounted on uneven surfaces. Learn how Southco's broad range of engineered access hardware solutions can meet your unique application requirements. Contact us for more information at: Assembly Fasteners Inc.
Home | Products | Privacy & Security © 2014 Southco, Inc. All Rights Reserved.